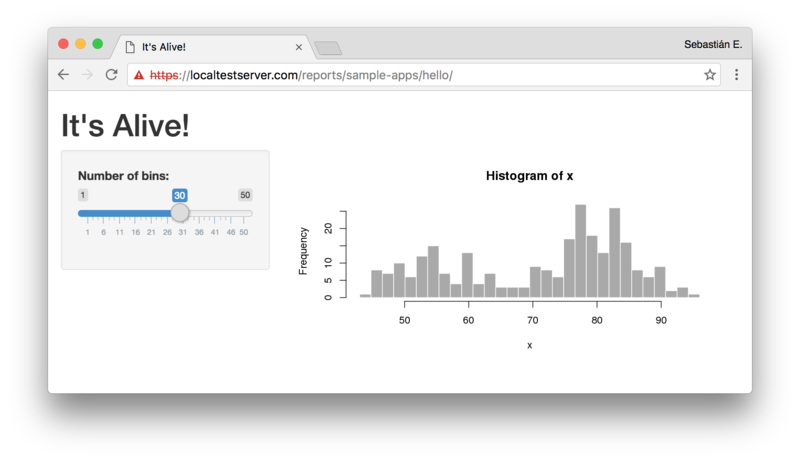 Shiny Server is a great tool to create visualizations and interactive documents for your R applications. It is also very popular. Unfortunately, the free version of Shiny Server does not support any form of authentication whatsoever. This precludes many common use cases such as taking your apps online, or limiting access to certain users inside your network. In this article we will show you how to add authentication to the free version of Shiny Server using Auth0. Read on! "We show you how to add authentication to the free version of Shiny Server!" So you know Shiny Server. If not, ask your closest data scientist and watch him or her drool. Data scientists love to turn their powerful R analyses into visual, interactive applications. And Shiny is just the right tool for that. Take a look at some of the demos in the product page. Nifty, huh? Well, there's a catch. Shiny Server is currently available in two versions: an open-source, limited edition; and a full-blown "pro" edition. Fortunately, for many use cases, the open-source edition is more than enough. But Shiny is a web application and two very important things for any web app are missing from the open-source edition: SSL/TLS support and authentication. In other words, using the open-source edition for public facing apps or internal apps that require at least some access control is a no-go. A while ago we explored the alternative of using an Apache server as a reverse-proxy for Shiny with an authentication module (auth_openidc). While this worked most of the time, there were two problems with this approach: WebSockets support was not available (it is used internally by Shiny for better user experience) and connections timed-out after a certain amount of time. However, not everything is bad about this approach. We just need to power it up a bit. So our own data scientist, Pablo Seibelt, took it upon himself to come up with a working solution: shiny-auth0. Shiny-auth0 is a simple reverse proxy with authentication, tuned-up for Shiny Server. It runs on node.js and makes use of Auth0 (through passport.js) for authentication, and http-proxy for full-blown proxy support. It is designed to run behind a fast nginx reverse-proxy, which can be found in most production environments. In other words, shiny-auth0 makes it a breeze to get authentication working with Shiny server without getting your hands too dirty. So, let's get to work! If you already have a working Shiny server setup with your apps, you can probably skip this step. For the purposes of giving a full working solution, in this step we will show you how to get a sample R app running on Shiny server, and how to find out the details we need to know about it for the next steps (hint: its IP address and port). Shiny runs on Linux servers. We will assume a fairly common CentOS 7 / Red Hat Enterprise Linux 7 setup. If you are using other distros, read the official Shiny docs to perform the installation. Login to the console as root and type the following commands. A word of caution: if you are not comfortable using Linux, ask a sysadmin to install Shiny server for you. He or she can use these steps, or follow the installation guide from the official Shiny docs. The following commands must be input inside the R shell. Then use a browser in a different computer and point it to http://YOUR-IP-ADDRESS:3838. If the computer running Shiny has a firewall setup, you will need to consult with your system administrator for the proper steps to access Shiny server. Nginx is a powerful and popular HTTP server. It supports a ton of features and is very fast. We will use Nginx to perform SSL/TLS termination. In other words, Nginx will act as the public facing server, with full TLS support (a must for secure connections). It will then forward all requests to our internal shiny-auth0 proxy server, which will run without TLS in our internal network (considered safe). # This proxies requests to our shiny-auth0 authentication proxy. The important part is near the bottom. Take a look at the last location / block. This block tells Nginx to handle all requests. Inside this block you will find two directives: proxy_pass and proxy_redirect. These directives tell Nginx to proxy requests to the host passed as parameter to them. This is were you should edit the configuration file to point it to your shiny-auth0 authentication server, which we will setup later on in this guide. Other important directives in this configuration file are ssl_certificate and ssl_certificate_key. These directives point Nginx to your TLS/SSL certificates. These certificates are used to secure the connection to the server. You must set a valid certificate and a private key here, as TLS must be enabled to properly secure your Shiny Server installation. If you want to learn more about TLS/SSL, or find out how to get your own free TLS certificate, head over to our Using HTTPS article. You can also ask your system administrator to perform these steps for you. It is also possible to use a self-signed certificate, if only certain clients need access to the server (and can install your certificate in their browsers). Since authentication will be handled by Auth0, a free Auth0 account is required to work with shiny-auth0. Don't panic, it's as simple as signing-up and setting a few knobs here and there. Let's take a look. First, head over to https://auth0.com and signup. Follow the steps to fill in your details. For simple use cases, a free account is more than enough. With a free account you get up to 7000 users. If you need more than that, check our pricing page. 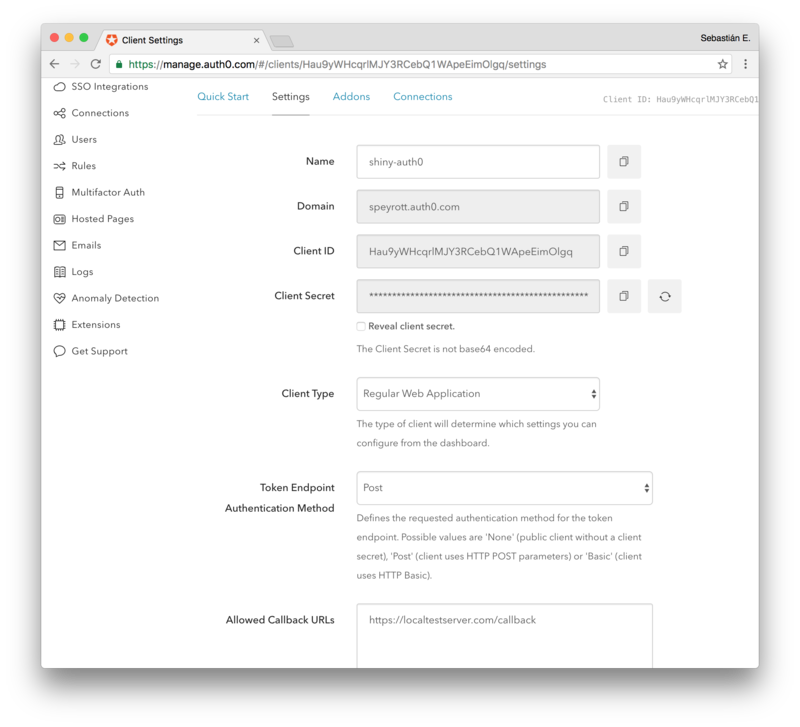 After you have completed the signup process, access the Auth0 Dashboard and create a new application for our shiny-auth0 app. This application will let you setup how your users will log-in through shiny-auth0. You have several options you must consider: will you use a standard username/password database? Or will you allow social logins (through Facebook or Google, for example)? It is up to you to decide what fits best your use case. For simplicity, we will go with a simple social login through Google. We will only allow certain users access to our Shiny Server. Take note of the Client ID, Domain and the Client Secret. You will need these later to setup shiny-auth0. Another important setting is the Allowed Callback URLs setting visible below. This is the URL the user will be redirected to after a successful authentication attempt. It is formed by the domain of your public server plus the callback path. For instance: https://shiny.yourhost.com/callback. Having a login screen anyone can access use to login after creating a user is usually not of much use. For instance, you may want to allow users whose email domain is the domain of your organization. To customize which users can login we can use rules. For our example, we will set a simple domain whitelist. Go to the Auth0 dashboard and pick Rules from the sidebar. Then pick Create Rule on the top right corner of the screen. Choose Email domain whitelist from the Access Control section. This rule is simple enough you will have no trouble understanding it. // Access should only be granted to verified users. Users whose email addresses have one of the domains in the whitelist array are allowed to login. Simple as that! Do note that rules apply to all Auth0 Clients (that is, multiple applications) from your account. You can filter which applications, or even connections, a certain rule applies to. Read more on rules in the docs. Finally we'll get to see everything working together. Once this step is done you'll have a fully secured Shiny Server. First, clone the latest version of shiny-auth0 to the system that will run the authentication proxy. COOKIE_SECRET should be a fairly long random string that should be kept secret. This secret is used to validate the cookie stored client side. Put a long, random string here. SHINY_HOST and SHINY_PORT are the actual host and port for your running Shiny Server installation from step 1. If everything is running on the same server, the defaults should be OK (localhost and port 3838). Lastly, PORT is the port where the shiny-auth0 authentication proxy will run. This port is the port that should be set in the proxy_pass and proxy_redirect directives from step 2. If shiny-auth0 will run on a different host from Nginx, don't forget to update the localhost part of these directives in nginx.conf as well. If in doubt, consult with your system administrator. Everything is up! Now test that everything is running as it should from a different computer. Attempt to access your Shiny host from a browser as setup in the Nginx configuration (the server_name directive). If you are not getting much help from your system administrators, the missing piece of the puzzle is to get shiny-auth0 to start automatically on each boot. Some distributions have their own startup systems, so covering every variation in this post is out of scope. However, many Linux distributions are converging on systemd for daemon management. So we'll setup a simple systemd service file for our shiny-auth0 server. Save this file as /etc/systemd/system/shiny-auth0.service. You may have notices we created a specific user to run this application. This is a common practice for services that do not require root permissions: by running the service as a user, even if the service is compromised, the attacker has limited access to the server (unless he or she can deploy an unpatched privilege escalation exploit). If you do want to run the service as root, remove the User and Group directives from the file. Remeber to set the right path to your local copy of shiny-auth0 in the ExecStart directive. If you need help with any of this, ask your local sysadmin. If you have succeeded in running Shiny Server with Auth0 by following the guide above, your local system administrator will not have any problems making the necessary changes to have this run in the appropriate servers, with automatic start on boot. 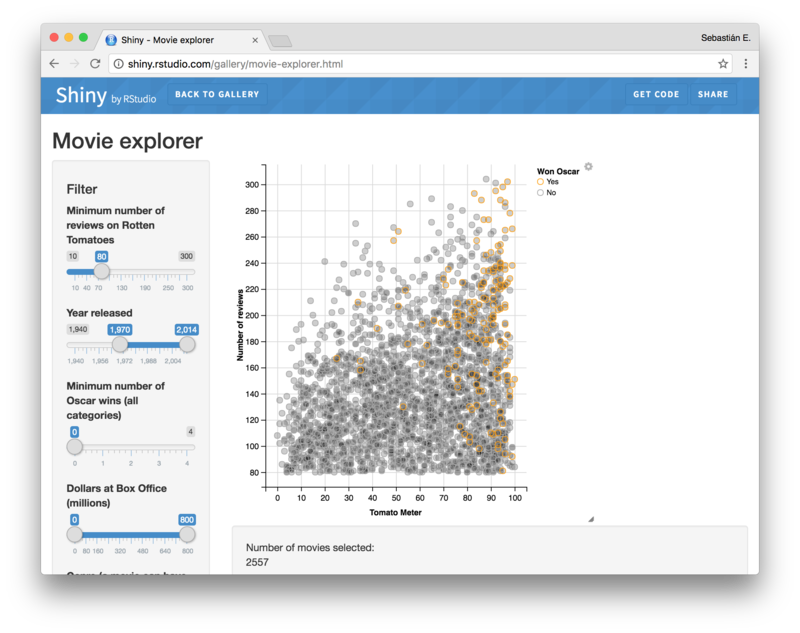 Shiny server is a great tool to visualize data using R. In spite of its limitations, the open-source version is really powerful. TLS/SSL support and authentication are essential for user facing apps, sometimes even inside private networks. Using Auth0, shiny-auth0 and nginx makes adding authentication and TLS support to Shiny Server Open Source Edition a breeze, even for people not versed in the arcana of Unix commands or programming. Leave us your thoughts in the comments section below, cheers!